Like a rolling thunder, a pouring rain, Speed and Strength are coming on like a hurricane. They're taking no prisoners and nobody's putting up a fight with the SS700 Hell's Belles Helmet. 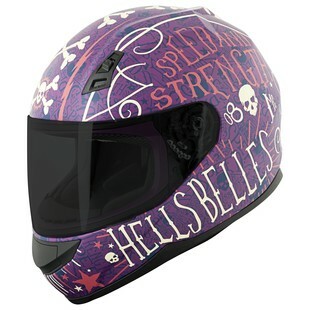 The new Speed and Strength SS700 Hell's Belles Helmet graphic uses the tried-and-true SS700 advanced thermo-poly alloy shell. Riding through fire and brimstone definitely works up a sweat, so it's a good thing the interior liner is fully removable and washable, and the direct ventilation will help you cool off once you finish your tour of the seven circles. Rumor has it that Hades has a temper. Luckily the Hell's Belles will stay firmly planted on your head thanks to the double D-ring chin strap. The temperature's high, and though you may ride through the valley of valley of darkness, you will be protected by Hell's Belles.